Bernardini sired his second consecutive Gr1 Travers winner on Saturday as favoured Alpha shared the victory in what was certainly a memorable day at Saratoga. It was a case of deja vu, as Alpha was entering the Travers having won the Gr2 Jim Dandy earlier in the Saratoga meet. The Travers-Jim Dandy double was completed last year by Bernardini's Stay Thirsty as well and Alpha emulating his sire as Bernardini (pictured) was a winner of the G1 Travers. The 2000 metre race is dubbed the 'Midsummer Derby' and Alpha showed plenty of courage to score after being forwardly placed just off the pace under a strong hold from jockey Ramon Dominguez before being turned loose approaching the home turn to chase down Golden Ticket to share the spoils. A three-time Graded Stakes winner, Alpha's earnings now surpass the $1 million mark. Alpha is one of five Gr1 winners for Bernardini and ranks alongside To Honor And Serve and Stay Thirsty, among others. The sire is represented by a remarkable nine Gr1 horses from his first two crops alone. In addition to Alpha, his best in 2012 include Graded winners Via Villaggio, Algorithms, and Le Bernardin. 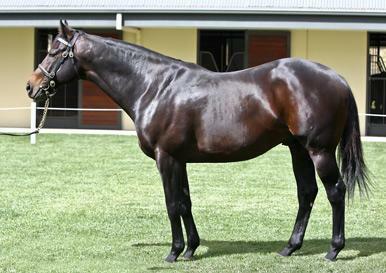 Bernardini's Australian offspring were to the fore on Saturday with Meidung and Toydini placing in Gr3 races in Sydney. Delbridge Racing has the Bernardini 3-y-old, Bernzigova, in work with top trainer Mark Kavanagh at Flemington. He is aiming to race in the spring with 1 x 10% share still avaialble in the promising colt.